Each week we feature an app that has caught the attention of the Crozdesk community. We look for exciting features that make our lives easier, apps that take a radical approach to existing problems or a service that has everyone talking about it. In other words, apps that we think you should know about. 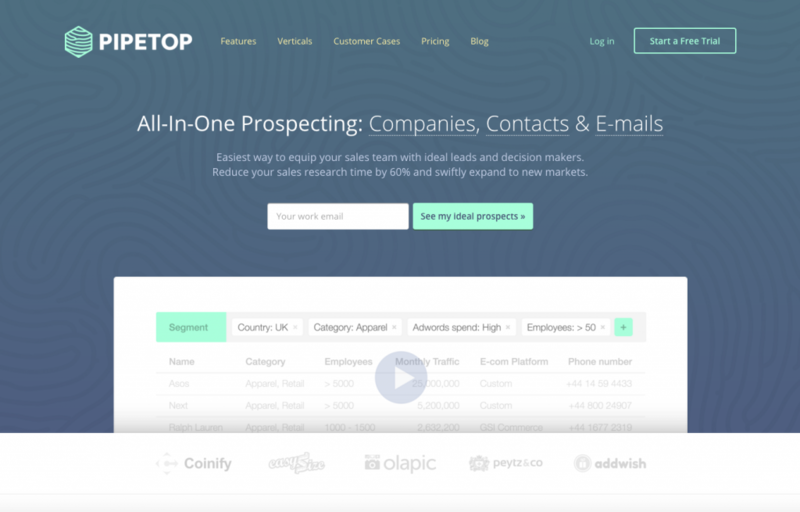 This week’s featured app is data-driven all-in-one prospecting and sales tool Pipetop – an app that has been purpose-built to make new business prospecting more efficient. Finding the right sales leads can be a huge challenge. Reaching influencers who have the available budget, authority and need to make a purchase decision can be difficult and time consuming. Pipetop equips businesses with relevant and highly detailed information about companies operating within their marketplace. Pipetop functions using information categories known as verticals – subdivisions of Pipetop’s continuously updated database of over 250,000 companies. It is this subdivision which enables Pipetop to offer users prospects which are more relevant to their business area. Pipetop contains four of these verticals: consumer brands; e-commerce companies; software companies and creative agencies. Each vertical is subdivided again into multiple industry areas. As an example, the consumer brands category is subdivided into twenty-four sub-categories, these include Apparel; Automotive; B2B; Consumer services; Restaurant Chains; Retail and Travel. According to the Pipetop team, this detailed categorization is achieved by a mixture of machine-learned algorithmic classification and manual human verification. 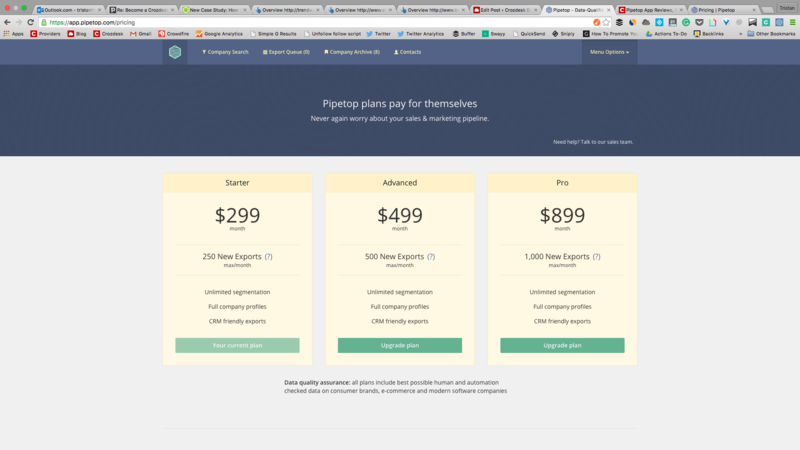 Having signed up for a free trial or one of Pipetop’s paid plans, users are directed to Pipetop’s main search page. Here users can begin prospecting by entering information about the industry or segment in which their company falls. Advanced search filters enable users to dig down into detail about the kind of companies they are looking to prospect to. This advanced search feature contains a surprising level of detail, allowing users to filter their prospect search with a wide range of company related metrics. It is worth focusing on the level of detail that the results of a Pipetop company search can reveal. Having set their search parameters, users can view a list of their search results and choose to export companies from this list to a CSV file. Clicking on a specific company will reveal a wealth of data including the company country of origin; the category in which the company is classified; the Pipetop score for that company; web traffic statistics; ad spend; number of employees; social media presence including numbers of social fans or subscribers; contact email addresses; URL’s for that company; the company address and even what kind of e-commerce, advertising or analytics systems that company is using. 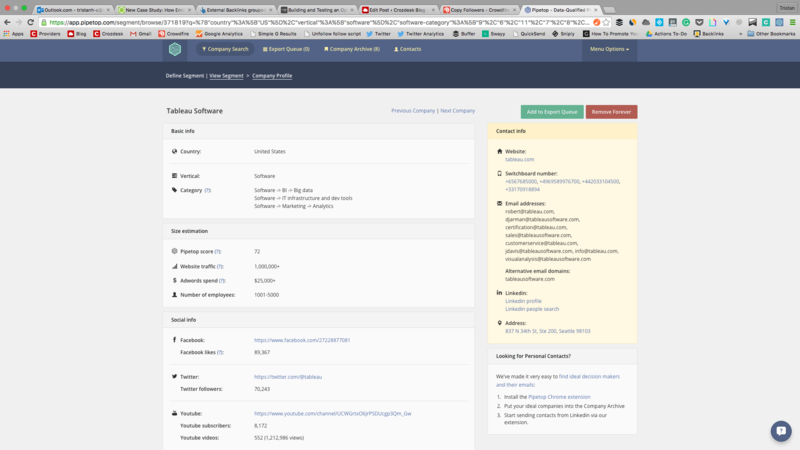 After using Pipetop for only a short time, it is easy to forget that such detailed company data is very hard to come by and often the result of hours of research. 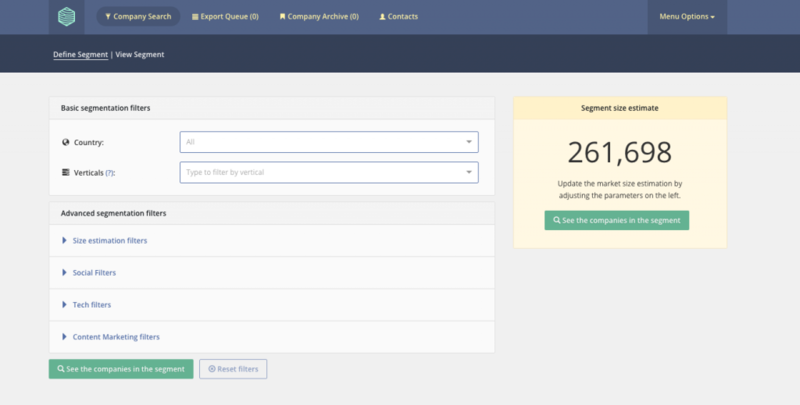 Pipetop makes all this information available to users in a few seconds, making it a highly useful source of information for sales teams and anyone seeking information on businesses operating within their market. 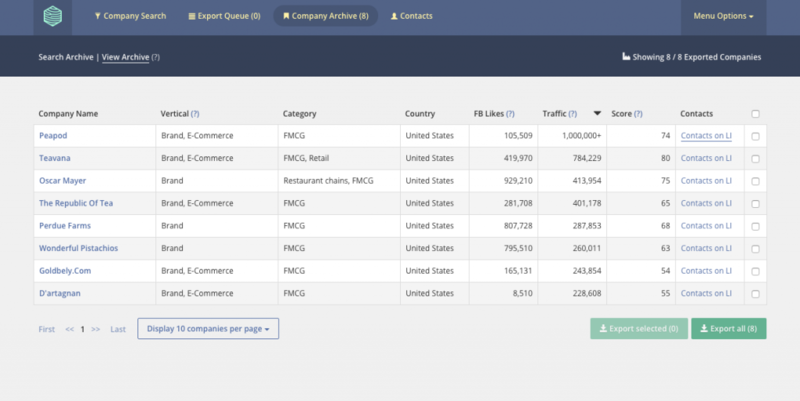 With a targeted and relevant list of companies in hand, Pipetop users are a step closer to contacting relevant prospects thanks to Pipetop’s data rich functionality. However, Pipetop offers another stage of functionality which allows users to reach out to newly discovered businesses using LinkedIn. 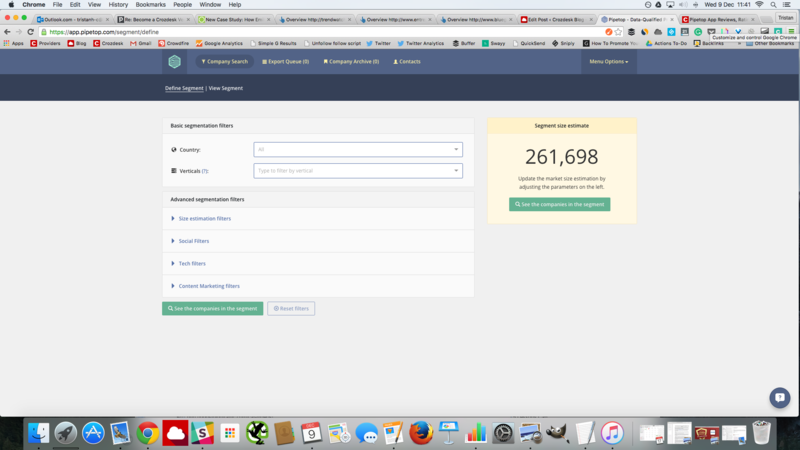 In order to outreach using Pipetop it is necessary to download the Pipetop Contact Finder plugin for Google Chrome. 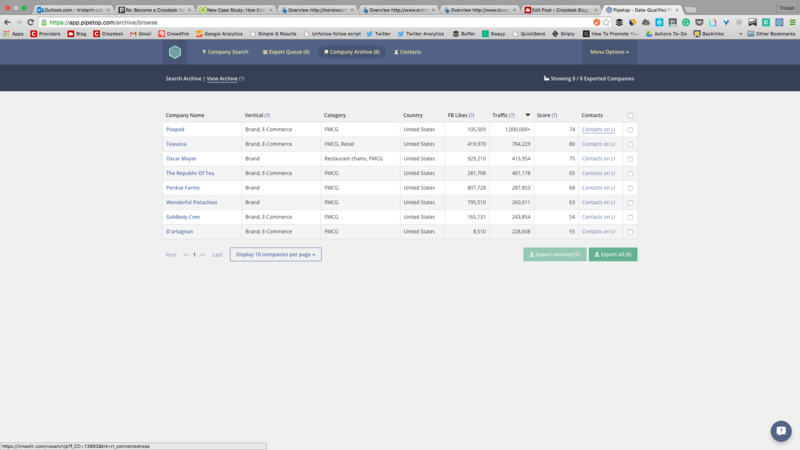 With the plugin downloaded, users can take advantage of its functionality by visiting the “Archived Companies” section of their user profile within Pipetop. 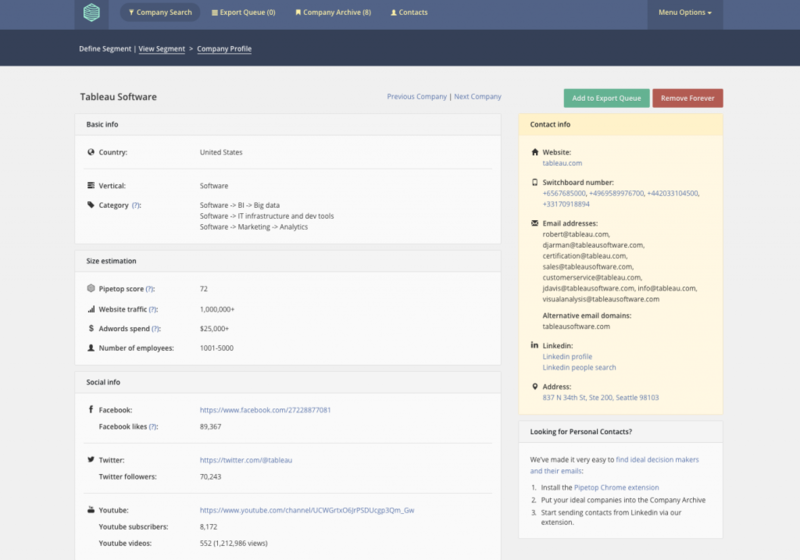 The archived companies list is populated when a user exports a company profile from Pipetop to their desktop – each exported company is automatically saved in the archived list. Within the archived list a “Contacts on LI” label appearing next to each contact, providing users have the plugin installed. Clicking these labels opens a LinkedIn page containing a list of employees working for that company. Thanks to the plugin, a Pipetop badge will appear next to each LinkedIn profile. 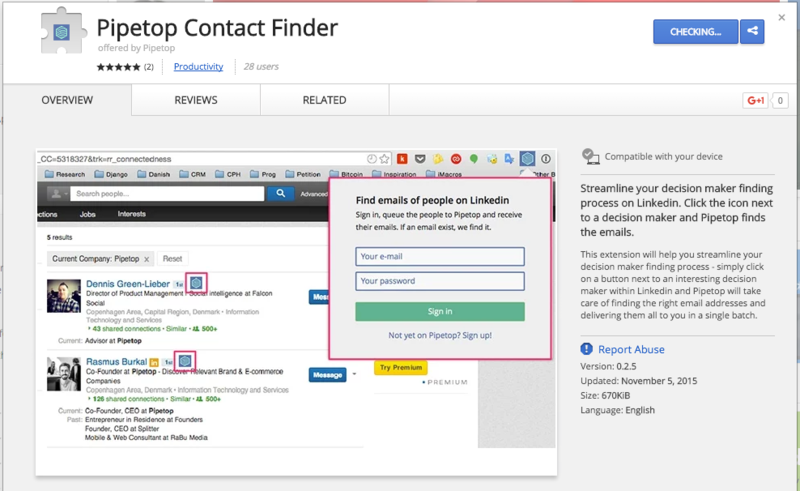 Clicking this badge enables users to export that LinkedIn contact to Pipetop, discovering and saving their email address in the process. 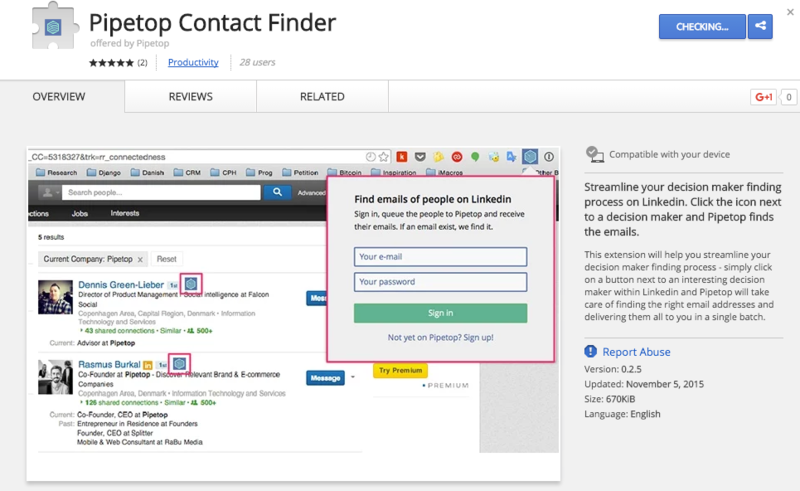 This ingenious functionality enables LinkedIn contacts to be reached by their personal email address when they would otherwise only contactable by an InMail. This feature has the potential to dramatically increase the effectiveness of new business outreach because it enables users to very quickly locate and reach out to relevant, influential employees working for the businesses on their prospect list. 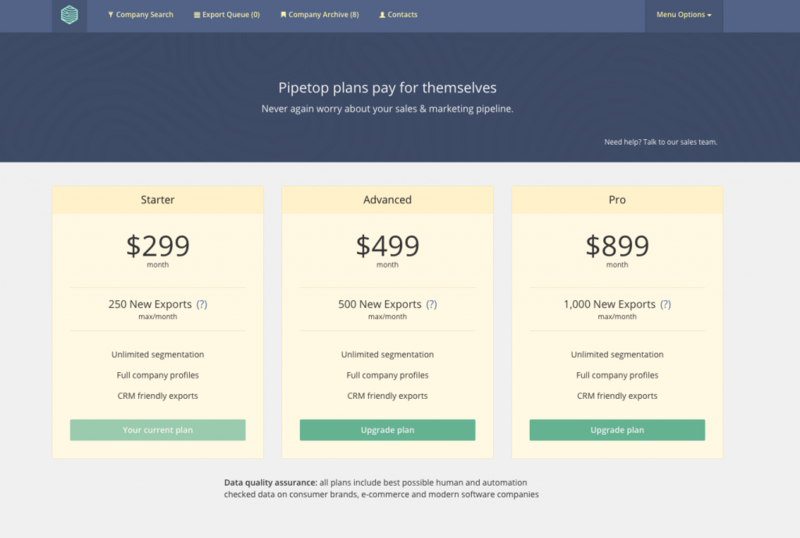 There can be no doubt that Pipetop will pay for itself in the hands of a busy marketing or sales team. The accuracy and level of detail available when it comes to prospect research could easily replace hours of painstcking research. Find out more about Pipetop on the Crozdesk Pipetop provider page.